Death Penalty Dispute Makes Its Way To Florida Supreme Court Orlando's chief prosecutor said she wouldn't seek the death penalty, so the governor reassigned her murder cases. She sued to get them back. On Wednesday, the dispute went to the state's high court. 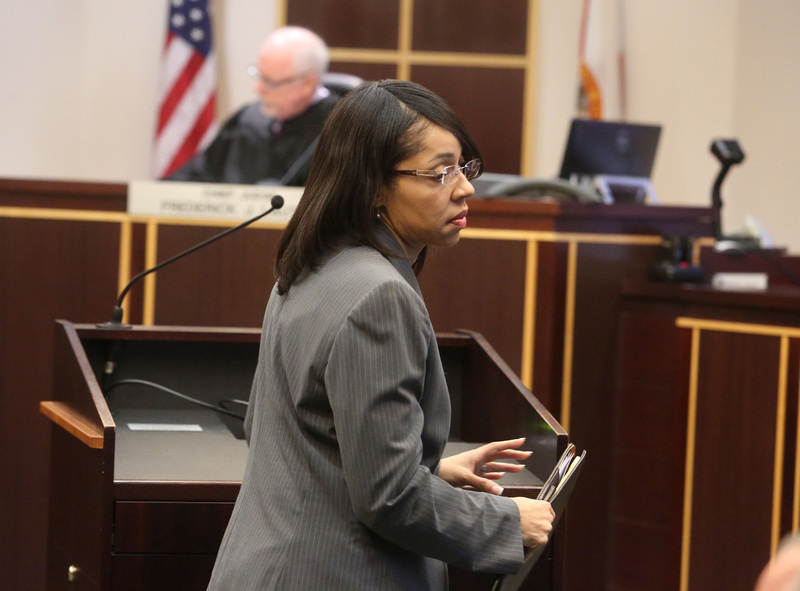 In March, State Attorney Aramis Ayala announced she wouldn't seek the death penalty in murder cases. The Florida Supreme Court heard oral arguments Wednesday in a legal dispute over the death penalty that pits a local prosecutor against the governor. At issue is whether Gov. Rick Scott has the authority to remove cases from State Attorney Aramis Ayala of Orlando because she won't seek the death penalty. When Ayala, a Democrat, announced her position in March, the Republican governor reassigned capital murder cases in her jurisdiction, including a high profile double murder of a pregnant woman and an Orlando police officer. "Ayala's complete refusal to consider capital punishment for the entirety of her term sends an unacceptable message that she is not interested in considering every available option in the fight for justice," Scott said at the time. Ayala sued to get them back. Scott is overriding the discretion of an independently-elected prosecutor says lawyer Roy L. Austin, Jr. who represents Ayala in her lawsuit against Scott. "By taking 24 cases away from State Attorney Aramis Ayala, Gov. Scott violated the constitution and the law," Austin argues. But Florida solicitor general Amit Agarwal says the governor has broad authority to reassign cases to further the ends of justice. He says Ayala's position is at odds with the state's death penalty statute. "It's like that law has been nullified," he argues. "Is it really the case that every single elected prosecutor in this state may adopt a blanket policy of refusing to apply or adopt any state law with which that prosecutor personally disagrees?" Agarwal asks. Ayala, who took office in January in Florida's Ninth Judicial Circuit, is the first black elected prosecutor in Florida. She says the death penalty is broken and does not achieve justice for victims' families. She didn't campaign on capital punishment but once in office said she had determined through research that pursuing the death penalty "is not in the best interest of this community or the best interest of justice." But several Florida Supreme Court justices question whether her position falls within prosecutorial discretion, given that she has applied it universally and not on a case-by-case basis. "It seems to me that discretion is not to ignore Florida law," says Justice R. Fred Lewis. "Your Honor, respectfully, there is nothing in Florida law that requires State Attorney Ayala to seek the death penalty," says Ayala's attorney Roy Austin. Chief Justice Jorge Labarga is skeptical. "So you're going to have a situation where in the state of Florida you're going to have one circuit with a death penalty, one circuit without it, all over the place," Labarga says. "How is that proper? Why do we need the legislature if we have that?" Ayala spoke with reporters after the oral arguments. "There was no blueprint for me to follow," she said. "I did what I believed was proper under Florida law and no laws have been violated." Justices did not say when they might rule in the dispute.